August 12, 2015 0 comments on "Canning Sweet and Sour Sauce"
My family goes through phases with eating certain foods, and lately they are all on an egg roll kick. My husband asked me to buy some sweet and sour sauce to go with the egg rolls, so I decided to look for a recipe and try canning sweet and sour sauce for myself. Well I found this great recipe and it turned out to be just what I was looking for. This recipe makes about 5 pints of sweet and sour sauce. You can either can it (instructions below), or if you don’t want to can it, place it in freezer containers and freeze it until you are ready to eat it. 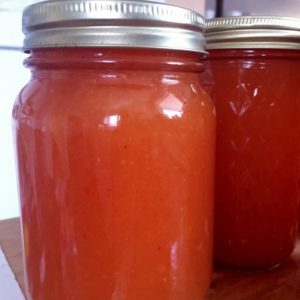 New to canning and want to watch me prepare this recipe? Click on the video below to watch me prepare this sweet and sour sauce recipe step by step. Note: You can use any color of bell pepper you like for this recipe. I used yellow and orange bell peppers, and the sauce turned out to be a beautiful orange color, just like store bought sweet and sour sauce. I think if you used green peppers, the color of the sauce would change. First chop the tomatoes, onions, and bell peppers. 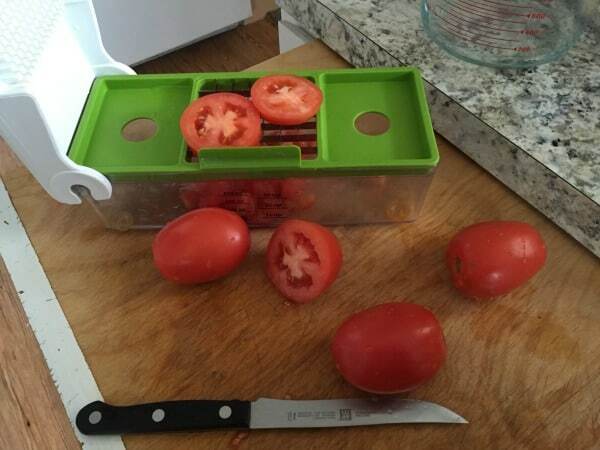 This vegetable chopper does an amazing job of chopping vegetables for you. I couldn’t live without mine! In a large sauce pan or dutch oven, combine chopped tomatoes, chopped onions, pineapple chunks, and chopped bell peppers. Bring to a boil. Add sugar and vinegar. Return to boil. In a separate bowl, combine the 1/2 cup sugar and Clear Jel . Clear Jel is the thickener for this recipe and will give you a nice thick sauce. Stir the pineapple juice you saved from the can to the Clear Jel mixture and mix well. Stir the Clear Jel mixture into the boiling tomato mixture. The sauce will thicken quickly. If you like a chunky sweet and sour sauce, then you can either can it now or let it cool to freeze it. 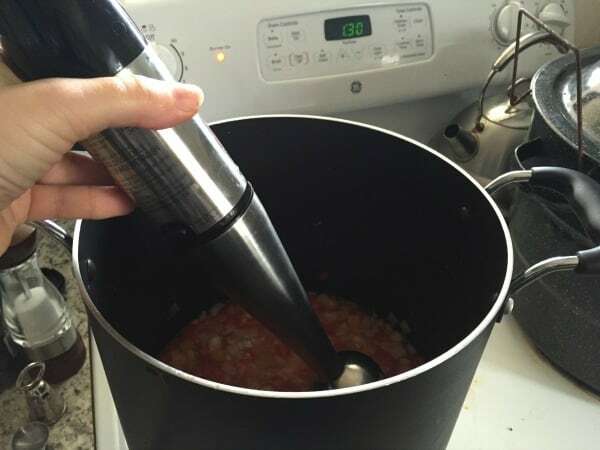 If you want a smooth sauce, use an immersion blender to blend it right in the pan, or you can put it in the blender. I decided to blend mine and the immersion blender worked great. If you are going to freeze the sauce, let the sauce cool and freeze it in freezer containers like these inexpensive freezer containers. If you are going to can the sauce, pour the hot sauce into sterilized pint sized canning jars, leaving 1/2 inch head space. Process in a boiling water canner for 30 minutes. Remove jars from boiling water canner and let cool until lids seal. You can store these jars on your pantry shelf for several years. They also make a great gift! And the taste? Oh my, it is really good. Really, really good! No need to buy sweet and sour sauce from the store again. Follow my canning and preserving and favorite recipes boards on Pinterest.